Are you desperate for a last minute gift? Or perhaps you’re looking ahead to the new year and want to finally get organized and actually remember everyone’s birthday on time? My name is Amy Chappell, and I’m visiting today from my blog, Ameroonie Designs. Today, I’m going to help you create a fun project that will do just that! One of my goals for the new year is to be more thoughtful and send actual birthday cards in the mail. There is just something so fun about getting a hand written note mixed in with all the bills and junk mail. But, in order to really follow through, I decided I needed to come up with a way to remember when those events are coming up. 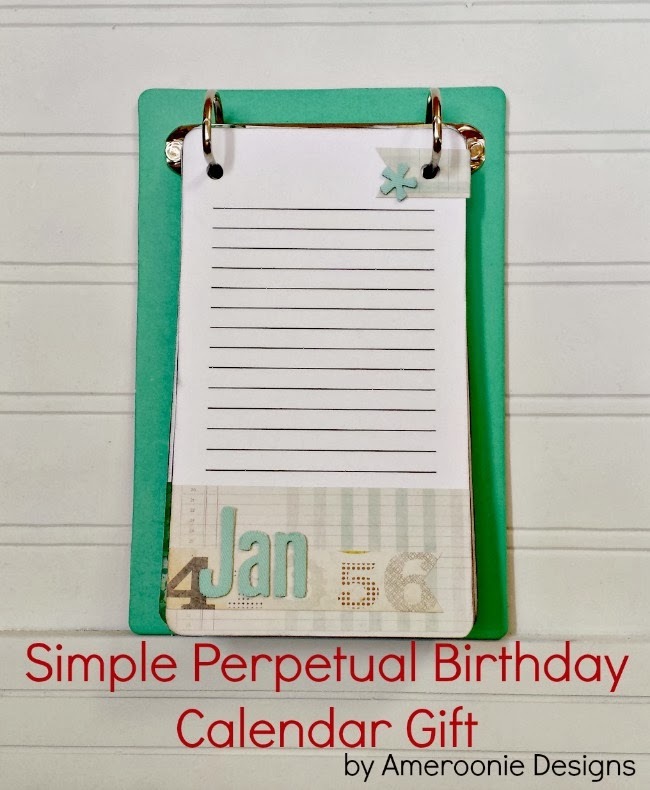 A perpetual birthday calendar is made once and then it’s done forever. All you have to do is add in new babies or friends to the list to keep it current. And this quick project will give you one that is not only functional, but cute as well. 6 copies of the blank monthly pages found here, printed onto card stock or heavy paper. Scrapbook paper, stickers and any other embellishments you like. A clipboard or some other way to keep the pages together. Once you have printed off your pages, you will need to cut them out. After that, it is just a matter of embellishing them as you like. I used papers, thickers and embellishments from American Crafts. 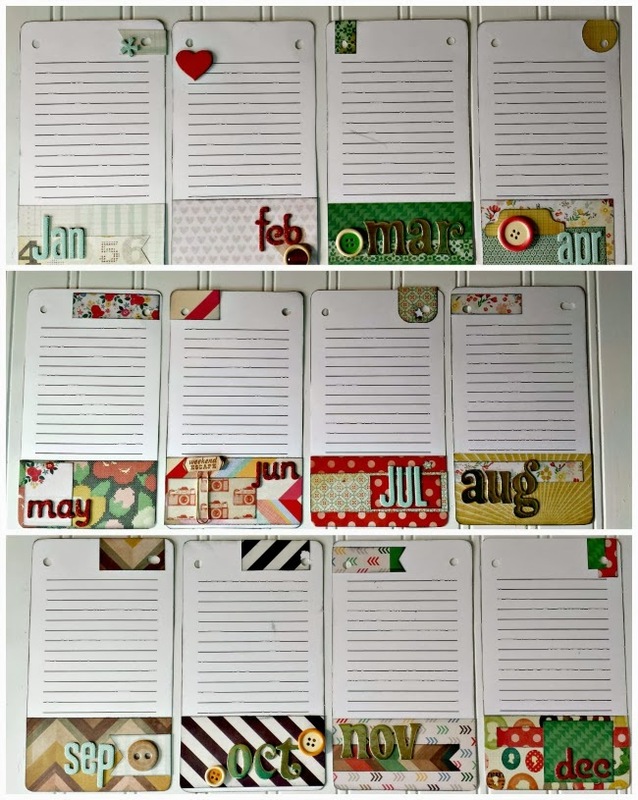 I chose to have the colors for each page reflect the month and season on it, but you could also create pages that co-ordinate with your decor. 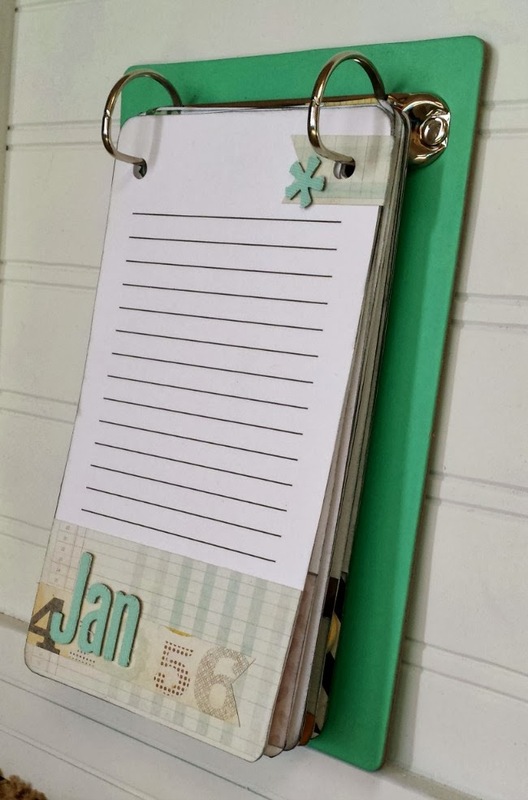 Keep in mind, that if you are using a clipboard to hold the pages together, you might want to use flat stickers and embellishments to prevent the pages from becoming bulky. You can see that my pages stand out quite a bit on mine. I found this darling ringed clipboard by Maggie Holes from American Crafts, and I love that it lets me go wild with my embellishments. Once all the pages are finished, just go back and add in the dates that are important to you. I like to leave room in between names so that if someone new comes into my life, I can make sure the birthdays stay in order. It helps with the remembering problem I seem to have. It’s been so fun visiting with you today. I appreciate Jen so much for letting me come stay a spell. Feel free to come visit me in my own little world any time. 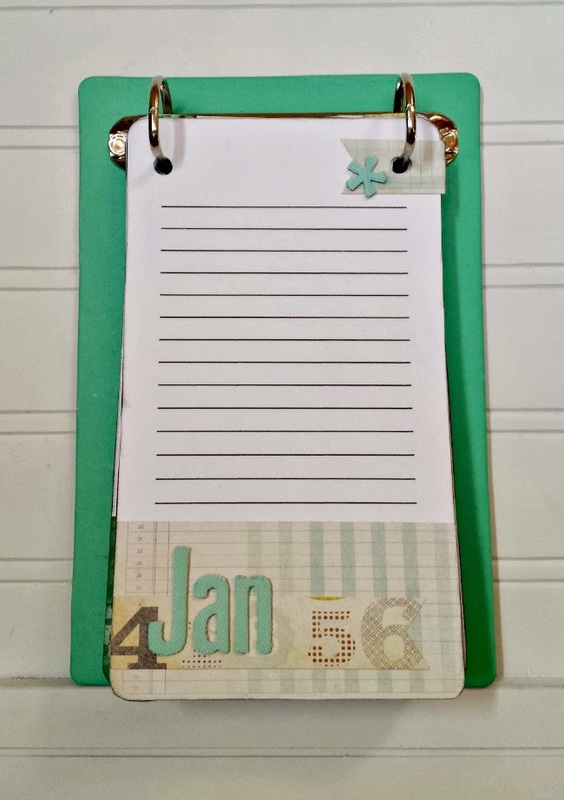 If you’re a crafter, you’re probably always looking for ways to get more organized! 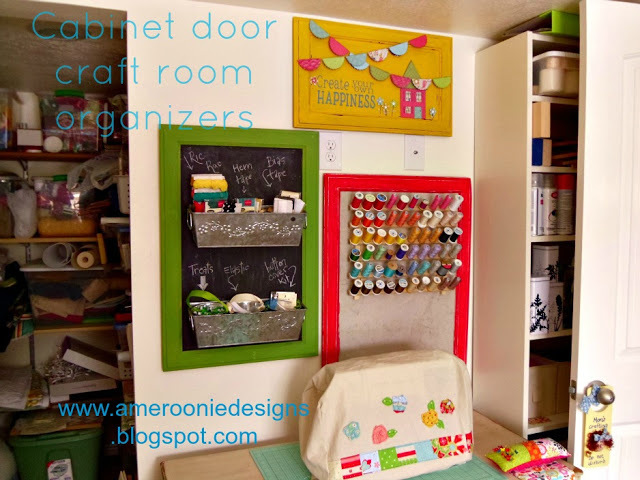 I love her idea for Cabinet Door Craft Room Organizers! 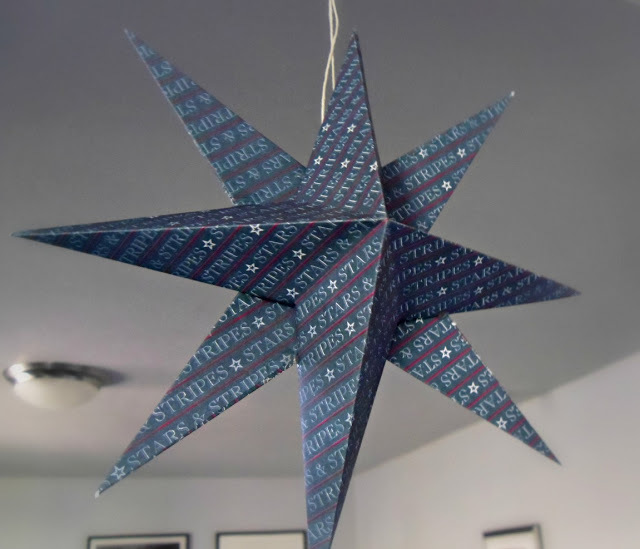 I love this Folded Paper Star Tutorial! I can see lots of fun ideas from this one that you could use for New Year’s Eve! And, I know it’s hard to believe, but Valentine’s Day will be here before we know it!! 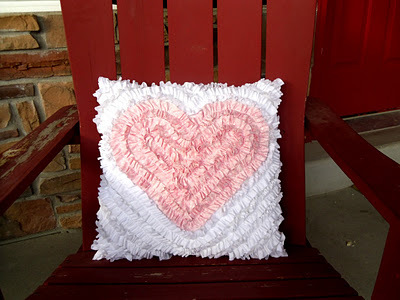 Her tutorial for making this cute Ruffle Heart Pillow makes it look so easy! Great Ideas — 17 Christmas Brunch Recipes! Gorgeous! Thank you for sharing. 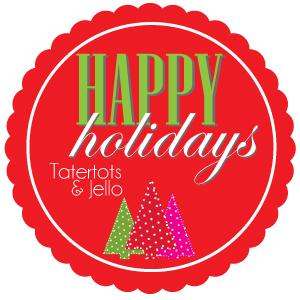 The merriest and brightest of days to you and yours.